Cinnamon-dusted roasted blueberries. Slivers of ginger crisped by the oven. White peaches just slightly warmed. Sometimes the best recipes are born of the random ingredients one has in hand. My husband has a love of blueberries that always leads him to pick up a pint at the grocery store, but then they end up forgotten, stashed in the produce drawer. I’m not a fan of the remnant bud on them, so they’re the last thing I want to snack on, and thus, they stay in the drawer. Until this week, wanting something light, I decided to make a salad. I figured roasted grapes are good, so why not roasted blueberries? Where on earth I had the idea to dust them with cinnamon I’ll never know. But I’m happy it did. After a dig through the produce drawers, I discovered I had a couple of white peaches, as well as the ubiquitous ginger. I needed a little protein to make this salad somewhat substantial, so I thawed a couple of sausages I got in my D’Artagnan delivery last week. As I was preparing the blueberries my husband suggested dusting some with nutmeg, which ended up being a fun contrast of tastes. The nutmeg brought out the blueberries’ tartness, while the cinnamon brought out their sweetness. Since all of the ingredients were fairly mild in flavor, you could enjoy the sweet tart subtlety as well. Preheat the oven to 400 degrees. Line a cookie sheet with parchment paper. Divide the blueberries into two bowls. In one bowl, add the cinnamon, and in the other, add the nutmeg. 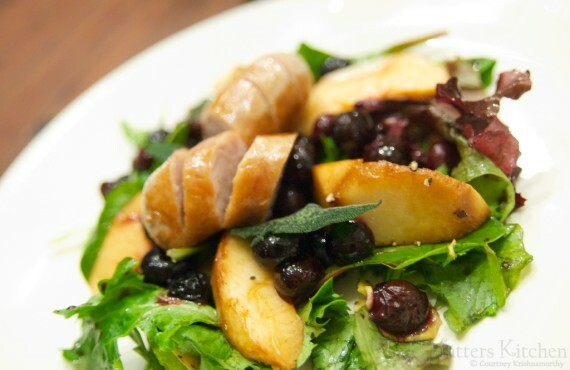 Drizzle each bowl with a scant amount of olive oil and toss the blueberries to coat with oil and spice. Place the blueberries, peaches, and ginger slices onto the cookie sheet in a single layer. Season the peaches with salt and pepper. 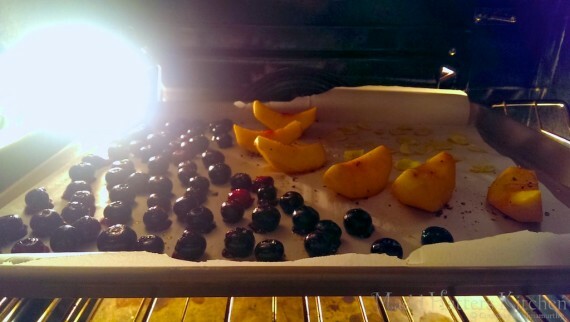 Cook for about 10 minutes in the oven, or until the blueberries have started oozing their juices, the ginger slices are just starting to crisp, and the peaches are just warm. Divide the greens between two bowls. Season with salt and pepper, and drizzle 1/2 teaspoon of balsamic vinegar or balsamic reduction over the greens, as wwell as a 1/4 teaspoon olive oil. Lightly toss the greens just to coat. When the roasted fruits and root are ready, divvy them up between the two bowls. Slice the sausage into pieces and place one link on each salad. Top with the fried sage leaves. Enjoy!